This new New York City hotel boasts a great location close to Times Square. 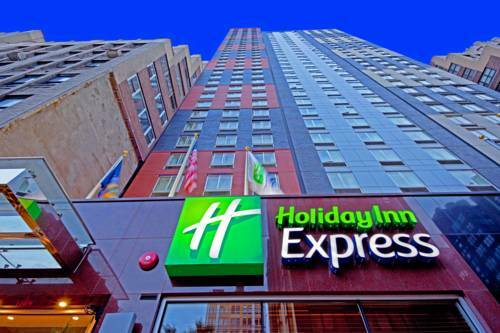 Located minutes from Times Square attractions, the Holiday Inn Express Times Square offers comfortable accommodations near New Yorks biggest attractions. With Times Square and Broadway outside our door, you'll find it easy getting to and from your New York City destinations. Within walking distance of our Manhattan hotel, you can find a wealth of attractions. Just a block from our New York City hotel is Times Square and Broadway theatres. Other well known New York attractions such as the Empire State Building, Broadway and Central Park are within a few blocks of our hotel in Manhattan. Located near 42nd Street, our hotel is close to the main subway lines so you can get around the city easily. For the business traveler, there are many major New York business attractions located near our hotel in New York City. Major headquarters including Merrill Lynch, Legg Mason and Ernst & Young are all within walking distance of our New York City accommodations. With our convenient Manhattan location, you can make it on time to all your New York City meetings. Consider starting your day with one of our famous cinnamon rolls from the hot breakfast bar. Additionally, you can stay connected throughout your entire stay at our New York City hotel with free high-speed Internet access. Let us host your New York City and Times Square Experience.